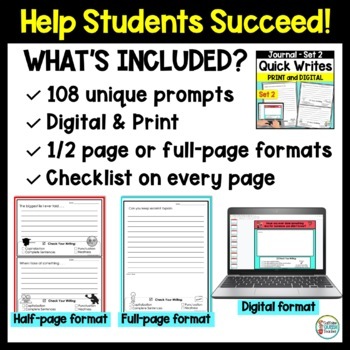 Get your students writing every single day with these 108 prompts laid out in a journal format that is simple and logical for students, and simple to prepare for teachers! I LOVE these Quick Writes prompts because they are fun and thought provoking and the length is just right! 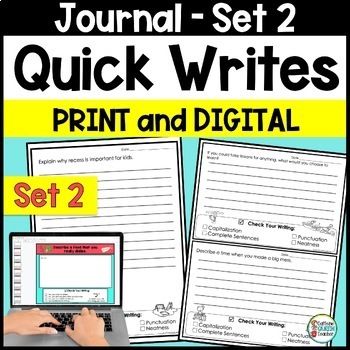 This Bundle of Quick Writes includes 108 different and unique prompts! I attempted to avoid controversial subjects and no specific holidays are mentioned. 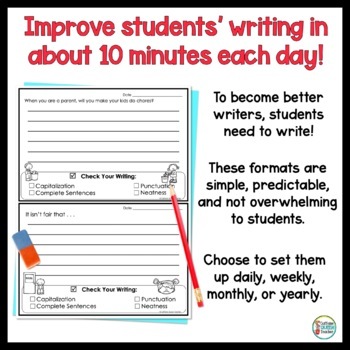 This Pack #2 provides additional prompts that you may need to finish out the school year when writing every day. This pack can also be used without using Pack #1. They are simply divided into 2 packs to avoid confusion. 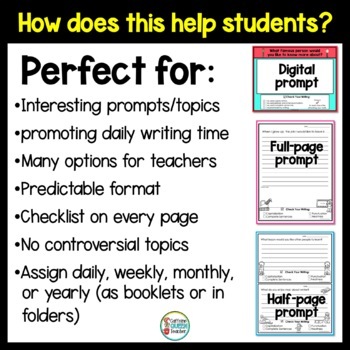 → The writing prompt types included are expository, persuasive, narrative, and creative prompts. The prompts lend themselves to interesting class discussions. → This journal could be bound in an attractive folder or binder and given as a Mother’s Day or Father’s Day gift!